Internet of Things (IoT) sits at the heart of Industry 4.0, the current trend of automation and data exchange that is hitting industries worldwide and becoming an essential component for cyber-physical systems. IoT holds great technical and economic worth as it promises to lower operational costs, increase durability of products and turn remote operation a reality. Experts have estimated that by 2025 there would be over 100 billion connected IoT devices, having a global impact of $11 trillion. At the very core of IoT is the "Smart Factory", a term used to describe an industrial environment that fully utilizes the power of Industry 4.0 concepts. One of IoT’s key promises is connectivity, which it has started fulfilling to some extent. The Supervisory Control and Data Acquisition (SCADA) systems of today are highly interoperable, and thus hold the capability to easily communicate with devices of varying protocols. 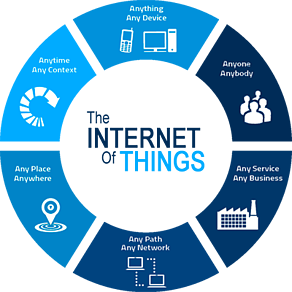 IoT data and IP networks are connected to each other, forming a mesh of communication linking decision makers directly to the factory floor. This means decisions can be taken faster, based on real-time data acquisition, allowing the efficiency of the entire plant to be raised to significant levels. For instance, a plant manager may use visibility tools installed on his/her tablet/phone to instantly view an assembly line’s performance. In turn he/she can make a decision for the line’s advancement or reallocation of resources, ultimately cutting cost and saving time. A vital requirement for the future, automation is an aspect of IoT that has established itself quite well compared to other dimensions. The ease with which data transmission takes place plays a huge part in advancement in the fields of automation. Research within Automation has always been "hot" due to its importance in automobiles and aerospace industries. But IoT has taken it to the next level, allowing seamless integration of various equipment, so that peak optimization can be achieved. An example is the Harley-Davidson plant in Pennsylvania, where the company has installed a software which can automatically adjust the machinery’s parameters based on measurements made throughout the assembly lines. Not only is automation necessary for lower costs, but it is vital for safe operation as well. SCADA systems that are highly dependent on IoT technologies are more reliable when it comes to handling utilities like water treatment, petroleum and mining. Power losses form a significant portion of any power grid, and eliminating those would prove beneficial both to industries and to the residential sector. Energy is the second largest operating cost in most industries, but several industries have started integrating the concepts of Smart Grid within their localized environment to get rid of the problem. Once again IoT is a major pillar of this solution, as it provides interoperable connectivity and real-time decision making capabilities to the user. A simple example would be installation of RTUs across various industrial zones, and monitoring the energy demand through an HMI software. In time, load curves can be formed, prediction be made and auto-scheduling be injected within the system during peak-load hours. Smart Grids, which is one of the most emerging fields in modern science, may be a combination of several principles, but in effect can be summed up with one concept: self-healing. How can a system become self-healing? Simple, when all the components work smoothly, and in a precise fashion. Redundant monitoring is already being used within industrial environments to provide pre-emptive solutions to problems that may occur due to abnormal conditions. Such systems are highly useful in settings like mines, power plants and large-scale industries where material and mortal accidents are bound to happen. Finally, forming an effective distribution network is as much important as manufacturing itself. While still in early stages, IoT assisted supply chains are becoming more common. The combination of analytics and IP networks are helping manufacturers gain a better insight into information management in real-time. The distributor’s sales information when integrated right into the company’s network can massively help forecasts and prediction, leading to accurate production as per requirements. The result would be less wastage and more timely delivery, meeting all product demands without any hassles.